If you are like me, you will often end up with a cupboard full of half finished packets of rice and grains. I like to cook them all up and use them in a healthy bowl. This one contained red wild rice, millet, freekeh, wholewheat bulgar and couscous. It served as the perfect base for this slightly Asian inspired bowl topped with lots of roasted and fresh veggies. The star of the show however, was the roasted white miso broccoli. This has to be my new favourite way to serve sprouted broccoli. It is so good, slightly sweet but salty, and full of flavour. Feel free to mix up the veggies depending on what you have available. Most of these are just what I had left over in my fridge! Cook your grain as per manufacturer instructions, drain, refresh with cold water and set to one side. Shred the red cabbage and sprinkle with a generous amount of ume seasoning, a good slug of olive oil, a squeeze of lime, season with salt and pepper and add the chopped coriander. Give everything a good mix and leave to marinate. The cabbage should be a little sour to contrast against the sweet miso broccoli. Mix the tahini and coconut milk, until thoroughly combined. Refrigerate until needed (it will thick up a little as it cools). Toss your beetroot in a little olive oil, season and roast in the oven at 190 degrees c. for around 40 mins, until tender. Meanwhile toss the butter beans in a little olive oil add the chilli flakes, season and roast for 20 mins, until they begin to turn golden and crisp. Whisk together the sesame oil, chilli sauce, tamari, and white miso and massage it into the broccoli. Spread it out on a baking tray and roast for 10 mins. Remove from the oven and sprinkle with the sesame seeds. Now you are ready to make up your bowl. 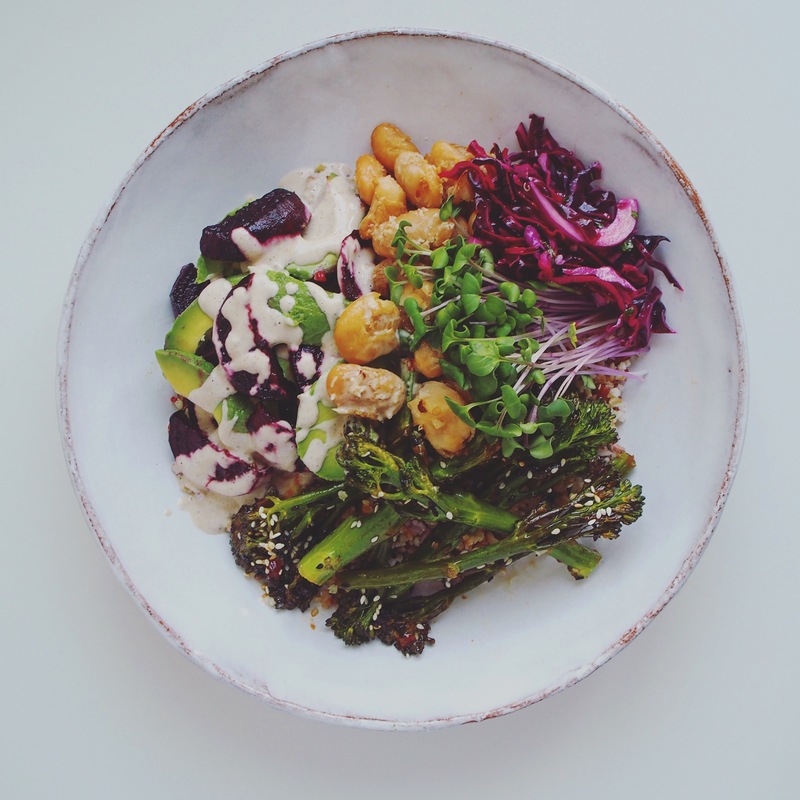 Divide the grains into portions and top with the roasted beans, beetroot, and broccoli. Add the sliced avocado a handful of the red cabbage and a drizzle of the tahini dressing. Final top the bowl with some of the micro greens and enjoy. Sango is a new company based in Espoo, Finland. They produce high quality micro greens used in restaurants and sold in select stores. I was lucky enough to test out the radish, broccoli and red cabbage varieties. They are sold fresh and therefore are very long lasting as long as you store them correctly between 2 and 6 degrees. I love adding them to dishes as they are full of fresh flavour and colour. I used the radish variety, but any of their range would work well in this dish.